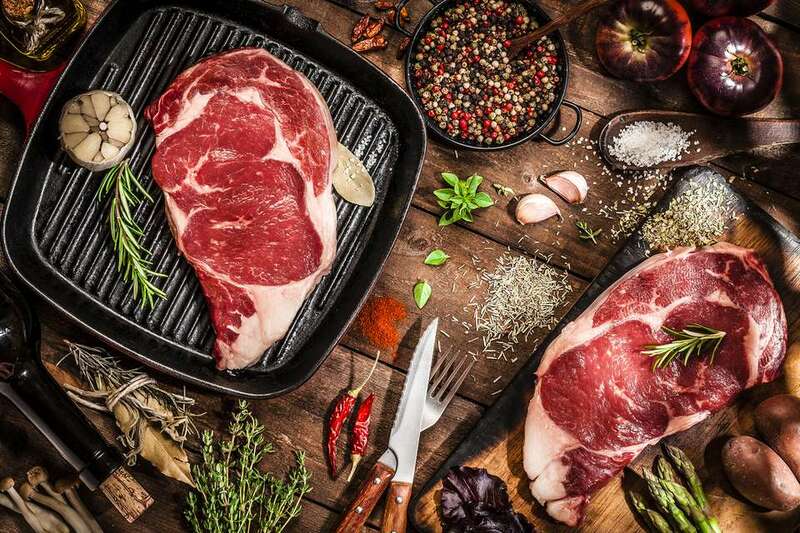 If you are purchasing ground meat at the supermarket or ordering a steak at a restaurant—whether a top steakhouse or fast-food chain—you are likely to find the label "Angus beef" listed. With all of the other distinctions, we find these days on our food (organic, all-natural, GMO-free), we may be left wondering where Angus falls into all of these categories. Angus frequently grades better on the USDA scale, but that doesn't mean that Angus is a grade of quality or that anything you buy labeled Angus is going to be better than any other cut. Actually, Angus beef has very little to do with the quality of the meat. What sets Angus beef apart is that Angus is the name of the breed of cattle. The beef is then inspected and graded (Prime or Choice), and then marketed to manufacturers, grocery stores, and restaurants. It is also set at a higher price than other types of beef. The term Angus does not imply that the beef is organic, natural, or of a higher grade than any other type of beef. Angus is the name of the breed of cattle that was specifically bred from cattle indigenous of Scotland by a man named Hugh Watson in the mid-19th century. It is believed that nearly all the Black Angus cattle alive today came from the results of Watson's attempts to maximize the black hide of these animals. In the 1870s these cattle were brought to the United States, and by the 1880s the American Angus Association was founded. There are Black and Red Angus, but the Red Angus is not sponsored by the American Angus Association and is a much rarer breed. The Black Angus, or more commonly, Angus, is a black-hided breed without horns (polled). The Angus breed has a number of advantages in the quality and production of the meat, and it quickly became popular as breeding stock to reduce problems of over-breeding in other lines of cattle. Because of this, and the general popularity of Angus by ranchers, it has become the most popular breed in the United States. What Does Angus Beef Taste Like? Since Angus beef is a specific breed of cattle and not a specific type of beef, you cook it the same way you would cook any other meat. If you purchase ground Angus beef, you need to cook it until there is no longer any pink showing; if you are making a roast or grilling a steak, you should cook it until it reaches your preferred doneness. Because Angus beef is generally more expensive than other beef, make sure you don't overcook the cut. How do you know that the beef you buy is Angus? All beef in the United States is inspected by the U.S. Department of Agriculture. This is mandatory and is performed for the reason of food safety. Beef grading, however, is voluntary and is done at the expense of the owner of the cattle. In the inspection process, the breed of cattle is legally determined by visual inspection, known as its phenotype. There is no genetic testing done to say exactly which breed it is. If cattle are 51 percent black they are classified as Angus, at least as far as the government is concerned. This means that meat and meat products labeled as Angus might or might not be mostly Angus. As Angus is the most common breed of cattle in the United States, you can feel confident that most of the meat you buy is Angus, or at least partly Angus. Of the 86 USDA recognized certified brands, representing 25 percent of all produced beef in the United States, 63 contain the term Angus. Angus is the magic word for beef marketing, and with that Angus label, you will pay more for the beef. There is a lot of deception in beef labeling. Stores sell lower grade beef with stickers that say things like "Butcher's Choice" or "Prime Value." Similarly, lower graded beef or frequently ungraded beef gets the Angus stamp and is sold to fast food chains as well as a whole host of other uses. This is not to say that these products are not made with Angus beef, it is just a reminder that if it says Angus, it doesn't necessarily mean quality. There really are no specific recipes using Angus beef (unless you are on the Certified Angus Beef website), so any recipe for beef will apply. A nice, juicy burger is made even better when you use Angus beef; try a spicy Sriracha bacon burger, or treat yourself to something completely decadent like a doughnut bacon cheeseburger. Since a nice cut of Angus beef will set you back a bit, you'll want to make it count with a simple and delicious recipe. Grill a beautifully marbled ribeye steak, a teriyaki flank steak, or a fajita-style New York strip steak. For a special occasion, cook up a beef tenderloin roast with red wine sauce, or a classic prime rib. Almost any grocery store, butcher, and specialty food shop should carry one form or another of Angus beef. The package of meat should be clearly labeled "Angus beef" and may also read Certified Angus Beef, a brand created by the American Angus Association to improve the breed that produces the beef that will bear their logo (this does not necessarily apply to all the Angus beef in the country). It must pass 10 criteria to be labeled Certified Angus Beef, which is also to ensure that the cattle they use are Angus by more than just a 51 percent black definition. In addition to the Angus beef qualification, the meat will also be distinguished by grade. As Certified Angus Beef (which is graded by the USDA) must be in the top two grades, it will either be listed as Prime or Choice. Choice grade Certified Angus Beef is generally of better quality than an average cut of choice beef. No matter the breed, type, or quality of the beef, it needs to be stored properly to maintain freshness and optimal flavor and texture. Raw meat can be kept in the refrigerator for up to 3 days without compromising safety or taste. If you plan to keep it longer, wrap well in an airtight package and place in the freezer where it can be stored for several months. Once frozen beef is thawed it should not be refrozen as this will encourage the production of bacteria. When handling raw meat, it is important to use separate kitchen utensils and equipment so as not to cross-contaminate other foods you are cooking. You also need to wash your hands after any contact with the raw beef. Angus beef isn't healthier than regular forms of beef; in fact, because it has more marbling—which means more fat—it is actually higher in fat than a leaner cut of meat. But, like all beef, it is a good source of protein, vitamin B12, zinc, phosphorous, niacin, vitamin B6, and selenium.